First Official Destiny Raid Race! All entrants get 3 months of supporter perks just for entering, plus 1 random group wins free shirts and swag! Image courtesy of EasyPeas, raid with him on PS4! Destiny and Destiny images are all property of Bungie. It’s been a wild ride this first year, and my, has it gone by fast. To celebrate the 100’s 1st anniversary, we want YOU to go fast. Get your 5 fastest buddies, and get through Normal King’s Fall as fast as you can. 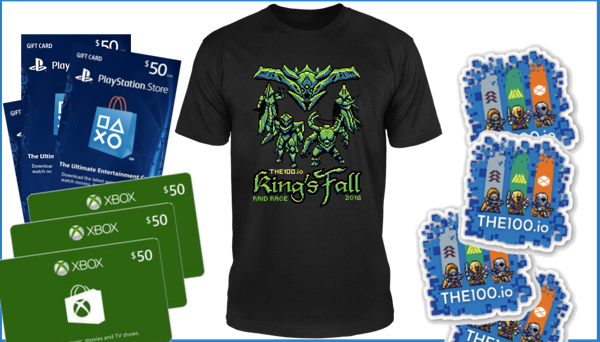 There is some sweet loot up for grabs, like some very special edition 100 gear, gift cards for your console, and even some lifetime supporter memberships. Gather your team, and fly you fools. Random winners TBD, and 3 months supporter perks for all entrants will be added soon. - Lifetime supporter memberships for YOUR ENTIRE GROUP OF 100! - Custom, limited edition T-shirts designed by Spykles, and other swag! A. If you are unsure about what is considered cheesing/glitching, ask in chat or email us. B. One Orb Strategy is NOT a cheese at Golgoroth. ALL FIRETEAM MEMBERS MUST COMPLETE ALL JUMPING PUZZLES/MAZES. A. Guardians may not be pulled ahead after tomb ships, or go to orbit to skip piston maze. Wiping in Golgoroth Maze to respawn at the door way is not permitted. B. You MUST activate all 3 plates in the piston maze to get through the maze. All fireteam members must be registered users on The100.io have a site activity score above 10 by contest deadline. Raid must be completed between January 1st and 11th, 2016. One submission per fireteam. (A user can participate in more than one fireteam). A. Links to Destiny Tracker and full length video (Twitch or Youtube only). B. Full list of Gamertags that participated in the fireteam. By entering, you give us permission to share your gamertags and game footage on the100.io. Contest only open to players 18 years of age or older, and in countries and states where this kind of contest is allowed.